BANGI, 21 Dec 2012 – There is concern that urban areas in Malaysia are becoming less healthy to live in because of increasing heat, pollution and floods. Research done by The National University of Malaysia (UKM) showed that more people in cities and large towns now complain of respiratory problems while absenteeism at work is rising, both in the public and private sectors. Profesor Dato’ Dr Shaharuddin Ahmad of the Faculty of Social Sciences and Humanities said researchers from the School of Social Development and Environment Studies recently found respondents who claimed that they were feeling ill more often. The qualitative social survey study was carried out through interviews and questionnaires and was not a scientific quantitative research. Giving his Inaugural Lecture on The Development and Impact of Urban Heat Islands in Malaysia here today, Prof Shaharuddin said people who responded to the study admitted that they were more likely to miss work now than several years ago. 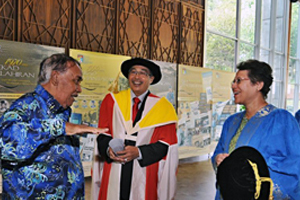 Vice-Chancellor, Profesor Tan Sri Dato’ Wira Dr Sharifah Hapsah Syed Hasan Shahabudin was present. He explained that the health problem identified is linked to what is called ‘Urban Heat Island’ (UHI), a phenomena which has brought about the increase of ambient temperature affecting indoor temperatures. The normal method of creating a more comfortable indoor environment is to use air-conditioning. However, cooling devices in an “air-tight building” will create health problems, such as the Sick Building Syndrome. This means that bacteria and virus remain in the building and circulate through the centralised air-conditioning system, which easily infect the inhabitants. The manifestation of this includes more workers applying for sick leave. A UHI is a metropolitan area that is significantly warmer than its surrounding rural areas due to human activities. The phenomenon was first investigated in the early 19th century and described by Luke Howard in the 1810s, although he was not the one to name the phenomenon. The temperature difference usually is larger at night than during the day and is most apparent when winds are weak. UHI is seen during both summer and winter. The main cause of the urban heat island is modification of the land surface by urban development which uses materials which effectively retain heat. Waste heat generated by energy usage is a secondary contributor. As a population centre grows, it tends to expand its area and brings about increases in its average temperature. The less-used term Heat Islandrefers to any area, populated or not, which is consistently hotter than its surrounding areas. Prof Shaharuddin said some researchers have tried several methods to deal with UHI, such as laying out gardens or growing vegetables on the roofs of high-rise buildings. These mitigation projects have yet to be tried in Malaysia but are underway in New York and Tokyo, where the UHI phenomena can be serious in Summer. He believes having gardens on roof-tops may help reduce the impact of UHI and high indoor temperatures as well as the impact of heavy rainfall and frequent storm water flows. Prof Shaharuddin said if the problem of storm water flow was not mitigated, it will not only increase the intensity of flash floods but also raise its occurance in urban areas which have high percentage of impervious surfaces. Monthly rainfall is greater in warmer cities, partially due to the UHI. The UHI decreases air quality by increasing the production of pollutants such as ozone while also decreasing water quality as warmer waters flow into the area streams, which stresses their ecosystems. 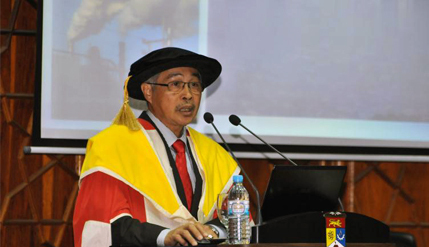 Prof Shaharuddin began his career at UKM in 1976 as a tutor in the Geography Department. In 1979 he obtained his Masters in Agricultural Meteorology at the University of Leeds, UK. 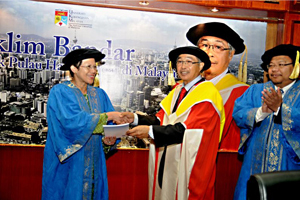 On his return to Malaysia, he was appointed lecturer at the Geography Department. He completed his PhD in Medical Geography at University of Manchester, UK in 1985. He was appointed Associated Professor in 1992 and later Professor in Applied Climatology and Medical Geography in June 2005.